Creating an HTML website can be a great solution if you’re planning to share your portfolio and services with the world or just showcase the most important information about yourself. Even if you’re a photographer or a writer, having a personal website is an important aspect of finding new clients and presenting yourself easily. We know that not everyone wants to invest in a premium template, that’s why we put up a list of 25 free HTML website templates! You can customize them as you please or you can just look through this list to get some inspiration. 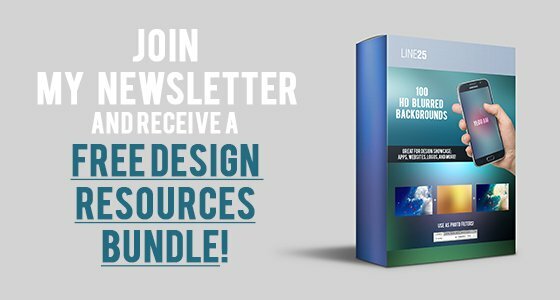 Most of these free templates come packed with amazing features like modern design, responsive layout, jQuery sliders and animations and many more! Most of them look like premium ones, so feel free to pick one and start creating! Mason is a HTML template that has a gorgeous and simple 2-column orange layout. On the left side you can insert your own logo and create a column menu and on the right side, you’ll have plenty of space to create columns with lots of content. It’s a perfect template for creating a portfolio for photographers, designers, illustrators and any other creative person. Mason is licensed under a Creative Commons Attribution 4.0 International License. 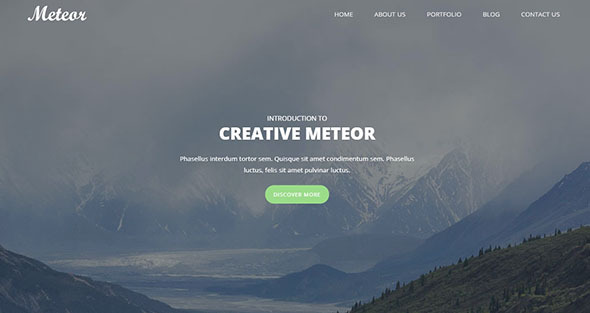 Meteor is a one-page fully responsive template that’s perfect for portfolios and simple blog pop-up texts. This is a great option if you’re looking to design a free website to showcase your work, your services, special offers, portfolio showcases and contact form. You’re free to use this template for any personal or commercial project, free of charge. Here we have another example of a free template for beautiful one-page websites. This template has a very clean layout based on Bootstrap HTML5. The homepage features a big, stunning background image that can be changed as you please and it also has an eye-catching parallax effect. Tinker Template is licensed under a Creative Commons Attribution 4.0 International License. You can use it to bring your ideas to life. 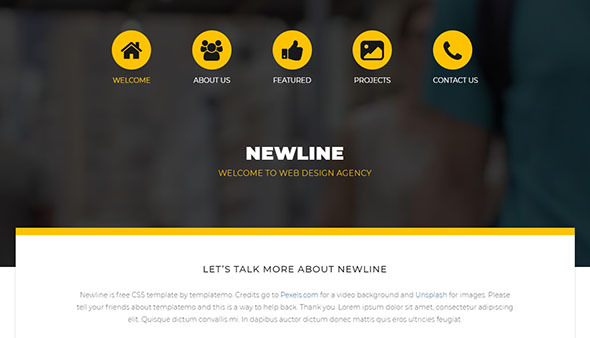 Newline is fully a responsive CSS template that’s a perfect fit for a creative agency, photographer, designer, architect and more! This free template has a clean design that’s based on a yellow and dark gray background. This theme also lets you insert videos as background for your homepage. The pages slide horizontally on a clean, white background. Newline comes with lots of nice icons and generous spaces for block texts and it’s completely free to use. Kalay is simple and creative HTML template that has both beautiful design and accessibility. This template is based on a purple and white design with strong colors. It can be quickly edited and used for your website and we strongly recommend it for portfolios, creative agencies, photographers, web designers, graphic designers or any other type of creative person that wants to create a personal space where they can showcase their work beautifully. Ziggy is a nice HTML5 Template with a professional and eye-catching zigzag design with strong angles. The theme is based on a dark blue color scheme and it’s very easy to customize. It gives you the capability to create beautiful websites that include icons, texts, portfolio showcases, images and a very useful contact form. 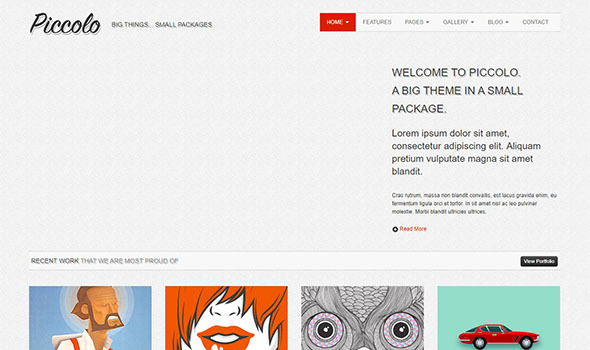 This template is fully responsive and it comes packed with a homepage and gallery page included. Feel free to use this template for any personal or commercial project you can think of. 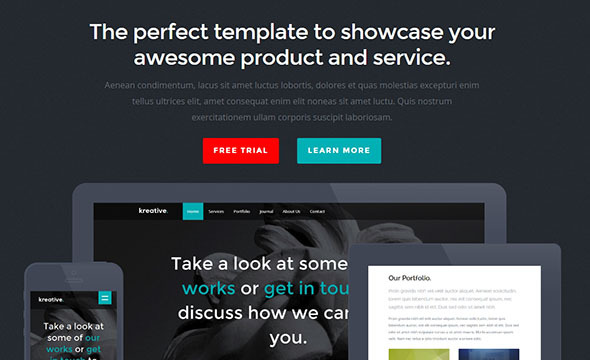 Kinetic is a professional-looking HTML template for mini sliding pages. This gorgeous free template comes in four different colors that are applied to the different pages that you want to create, so each page can a have a specific look and feel to it. 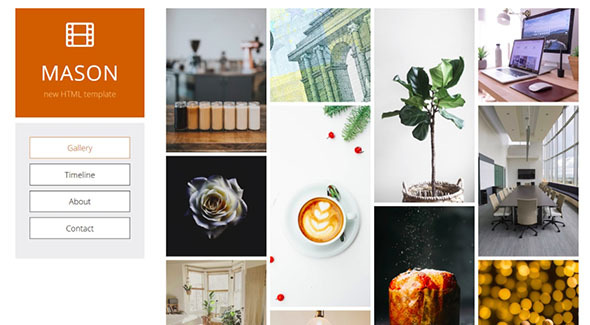 The gallery template is simple and clean and it comes with an image popup. We recommend it for creative agencies or individuals that are looking to create a strong online presence and a platform where visitors and potential clients can see their work and easily contact them. Nevada is a free minimal one-page HTML template that was created and coded with great care by Nicola Tolin, a web designer based in Italy. We think this template is perfect for photographers, designers and any other visual artists that want to create a simple portfolio platform where they can showcase their own work in a clean and user-friendly way. Nevada is built on the top of the Bootstrap framework and it comes packed with a lightbox gallery feature that lets users see the images at their full resolution. This template is great for sharing your work with the world and finding new clients. Snow is a free website template designed and released by Svetlana S. that you can use for your personal or commercial projects. It has a very modern and minimalist look and it will work perfectly for portfolio showcases for visual artists or companies too. This template comes with both PSD and HTML files and it includes a front page, two portfolio pages and two blog pages so you can choose the ones that are perfect for you. If you’re looking to create a WordPress website instead, the premium version is available for buying. Lithium is a free HTML5 one-page template that was built using CoffeeScript, SCSS and Grunt. 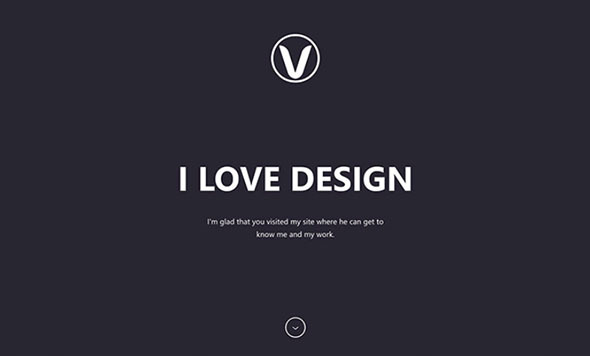 It was created by Vadim Goncharov, a web designer and developer and it can be used for free for any project you may have. This template is fully responsive and it comes with great typography choices and a clean design. It’s great for anyone that wants to present their work and services in a professional way to their clients. 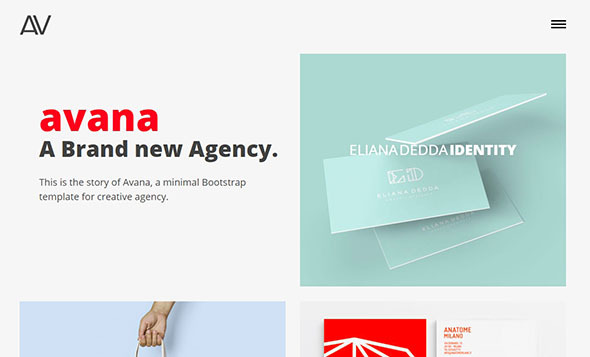 Avana is a free HTML template that’s ideal for creating minimal and clean portfolios for creative agencies or individuals that want to create a strong online presence. This template is built on the powerful Bootstrap framework and it comes with tons of Google Fonts and nice scrolling animations. Avana was designed and released by the creative team at Designstub and it comes with a front page, a team page, single work page, blog page, blog post page and contact page. OAK is a free HTML template designed especially for portfolios by EliteFingers, a web development & branding studio. We recommend this template for any designer, architect, photographer or creative studio that needs a personal, easy-to-customize website to showcase their work and services. OAK is built on the top of Bootstrap 3 and comes with 15 pre-made pages so you can choose the ones that are perfect for your purpose. 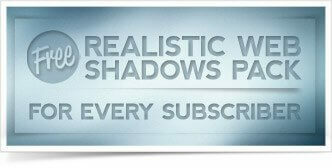 One of the awesome features that this template has are the jQuery and CSS3 animations. It’s fully responsive and has a modern look and feel. techniques to create superb eye-catching animations and make your visitors love you and your work. It is simple, modern and responsive. Apollo is a black and white one-page HTML template built with Sass and Jade by Bucky Maler, a front-end developer from Texas. This template was created with professional photographers in mind. It’s a perfectly free solution for any photographer that needs an easy, attractive and effective way to share their work with past and future clients. Apollo has a very clean look and great typography choices. Kreo is a free, fully responsive website template that can be used for various purposes and projects. It has a very clean and bold design and subtle CSS animations that will create a unique scrolling experience for your users and clients. Kreo was coded and released by styleshout. The template is based on a black and yellow design with special pages for services, about and contact. It’s fully responsive and can be used for free to bring your ideas to life. Urku is an HTML website template that has a minimal and flexible design that’s also fully responsive. This template can be used for free to create stunning portfolios. It comes with lots of pages that you can customize in order to present your business and services to the world. This template lets you create multiple styles of portfolios including Flex, Switch, Static and Masonry. Urku template was released on Pixeden. Sedna is a fully responsive one-page website template that was designed using the powerful Sketch tool and coded with the latest web technologies (HTML5/CSS3). This awesome template was released by Peter Finlan. Sedna is so flexible and versatile that it can be used for countless purposes and projects. It’s also fully responsive and will adapt well to any device, screen size or browser. You can also download and re-use the Sedna open source code for any other project you like. If you’re looking to create a stunning landing page for your personal or commercial project, then Woo is the perfect choice for you. This free template has a clean and modern look that will fit any idea or purpose. It has a fully responsive design and it looks and works perfectly on a wide range of browsers, gadgets and mobile devices. Woo is the perfect template to showcase your apps, services or digital goods. It was designed and released by Styleshout and can be used for free to bring your ideas to life. 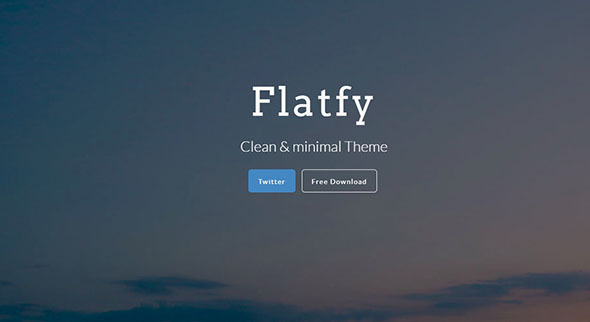 Flatfy is a flat template that has a very modern and clean look. Flatfly was designed with creatives in mind and it gives anyone the possibility to create a fully functional and beautiful website for free. This gorgeous theme was designed and coded using Bootstrap Framework, HTML5, CSS3 and jQuery. It was released by Andrea Galanti and we recommend using it for any kind of personal or commercial project you may have in mind. 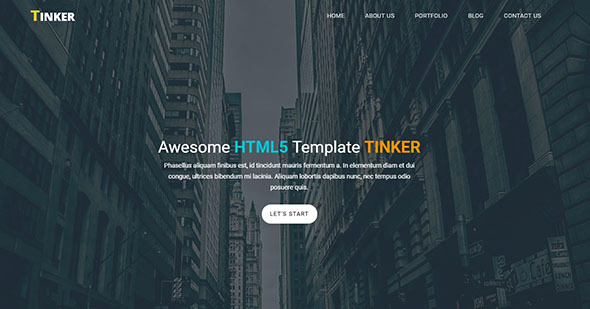 Global is a single-page HTML template that was created and released by Bucky Maler. You can use it for free to create gorgeous, professional-looking portfolios that will attract new clients. This is a fully responsive template with an independent grid framework independent that comes with lots of different navigation styles: on click, on scroll, on arrows key press and on touch swiping. Global comes with another awesome feature: a 3D perspective menu with nice, clean transitions. Here we have another great example of a photography-inspired website template that can be used for free to create a website to present your work, portfolio and services to the world. This template comes with an expanding stack slider and a background image tilt effect that will create an unforgettable experience for your visitors. 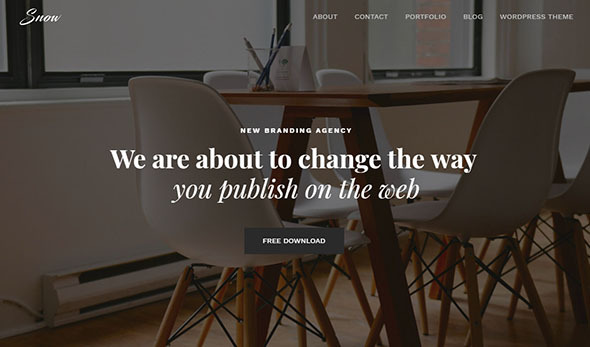 This template was created by Codrops. 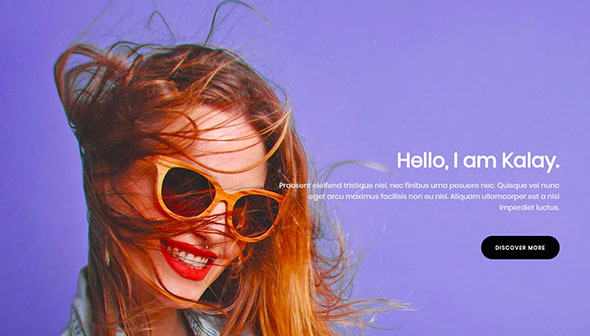 Beetle is a stunning freebie that you can use to create nice, colorful HTML websites. This is a fully responsive template created with designers in mind and it comes with lots of parallax features. It was designed by Frank Rapacciuolo and coded by Pasquale Vitiello. You can use this template for free for your projects and ideas. 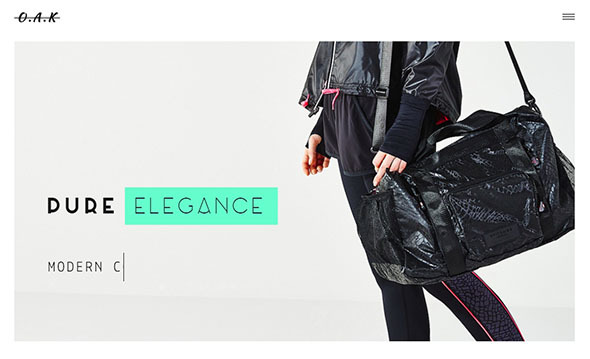 Elegant is a free template that comes both with HTML and PSD files. It was created by Diogo Dantas and it has a very clean and modern look. Feel free to use this template to design creative portfolios for you or your business, free of charge. 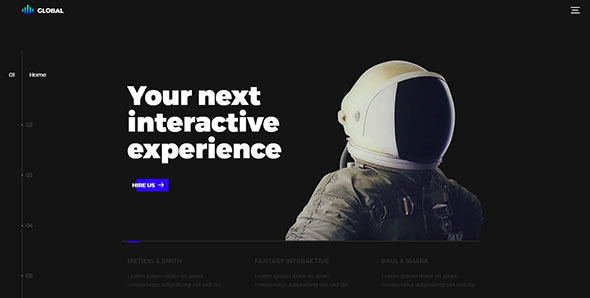 Halcyon Days is a gorgeous one-page portfolio template made by Peter Finlan. We strongly recommend it for professional-looking portfolios or start-up websites. This template can easily be customized in order to fit your needs and desires and can be used for free as you wish. Here is another great option of a template that you can use for free to create an eye-catching portfolio. 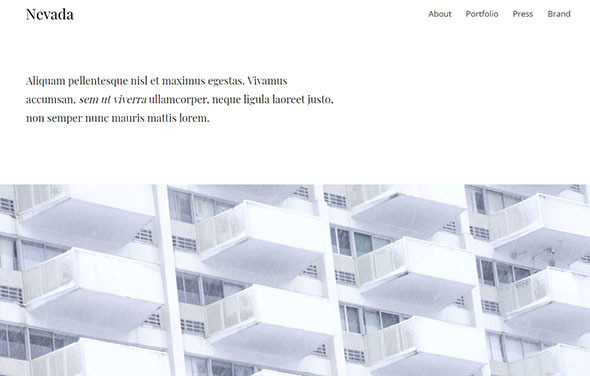 This HTML template was built using the Dribbble API. By using this template you can create a beautiful and fully functional portfolio and have your website up and running in minutes! 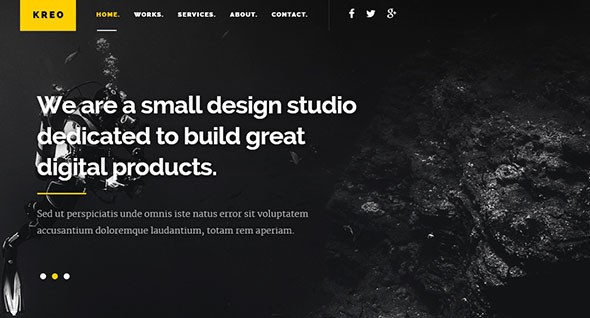 Piccolo is a free Bootstrap HTML template that has a clean and pleasing design. This theme comes packed with 19 different page layouts with sliders, sortable galleries, lightbox popups, alerts, icons and more!